A poem written in Elder Scrolls V's language of dragons appears to tell us something more about the upcoming RPG. The announcement trailer for Elder Scrolls V: Skyrim was a bit mysterious in its reveal of anything about the game other than the existence of "dragons," and the latest information follows that same trend. 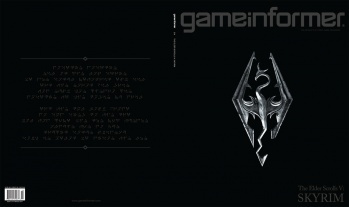 The cover of the February issue of Game Informer is set to feature Skyrim, with a cryptic poem about the game on the reverse side. The poem is written in the "tongue of the dragons," a new language created by Bethesda for use in the game. In the Skyrim trailer, it's the language being sung towards the end. GI says the tongue plays an "integral role in the story and gameplay of the upcoming epic, and introduces an intriguing new facet to the Elder Scrolls mythology." Alduin's identity seems a bit complicated, but he's apparently the Nordic version of Elder Scrolls' Akatosh, the Dragon God of Time. The Nords call Alduin the World Eater, and believe him to be a "ravaging firestorm that destroyed the last world to create this one." The Nords will likely play an important part in Skyrim, as their home is the region that shares the same name. It's not much more to go on, but at least we have a hint towards one of the major evils players will face in Elder Scrolls V. It'll just be a dragon god that can control time and swallow the world whole. No big deal.